Hans Christian Andersen. “The Mermaid.” The Mermaid and Other Tales. Trans. Edgar Lucas. Illus. Maxwell Armfield. London: J.M. Dent & Sons Ltd.; New York: E.P. Dutton & Company, 1914. Hans Christian Andersen’s “The Mermaid”, is a literary work whose plot focuses on a mythical archetype (a mermaid) and her desire to attain the love of a mortal prince. The text we will focus on for this exhibit is The Mermaid and Other Tales, a collection of Andersen’s fairy tales edited by F.C Tilney, illustrated by Maxwell Armfield and translated by Mrs. Edgar Lucas. It was published in 1914 as part of a series called “Tales for Children from Many Lands”, which implies it was intended for a child audience. We compare this to Disney’s adaptation of this fairy tale, entitled The Little Mermaid, which incorporates the original version in terms of the plot, but sanitizes and commercializes it in a way to appeal to the contemporary child. The portrayal of female maturation through this fairy tale differs between variants. 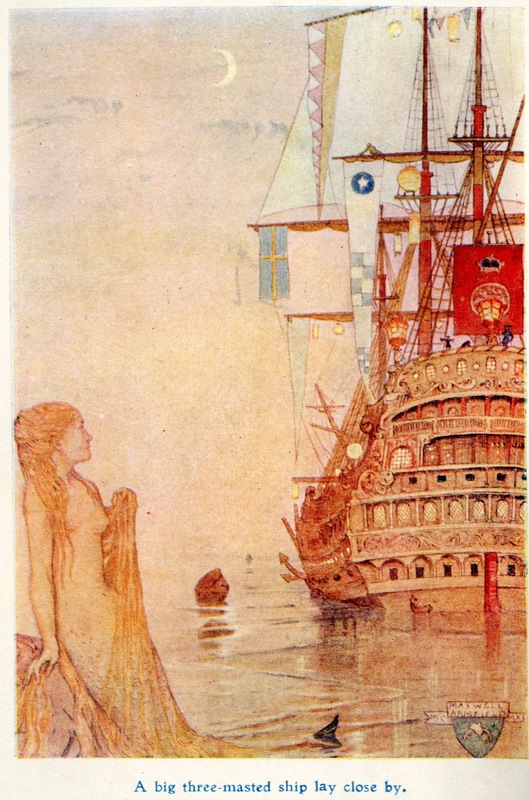 The first section, focusing on the The Mermaid and Other Tales text is written by Brandon Kates and deals with female coming on age in Andersen’s “The Mermaid”. The following section is written by Antonia Wales and compares the differences between the Disney and Andersen versions. The Mermaid and Other Tales is a collection of stories that was part of a series called Tales for Children from the Many Lands and was written by Hans Christian Anderson and illustrated by Maxwell Armfield. Hans Christian Anderson was a Danish writer and poet from the 19th Century, well-known for his children’s literature and his works have has influenced much of postmodern pop culture. 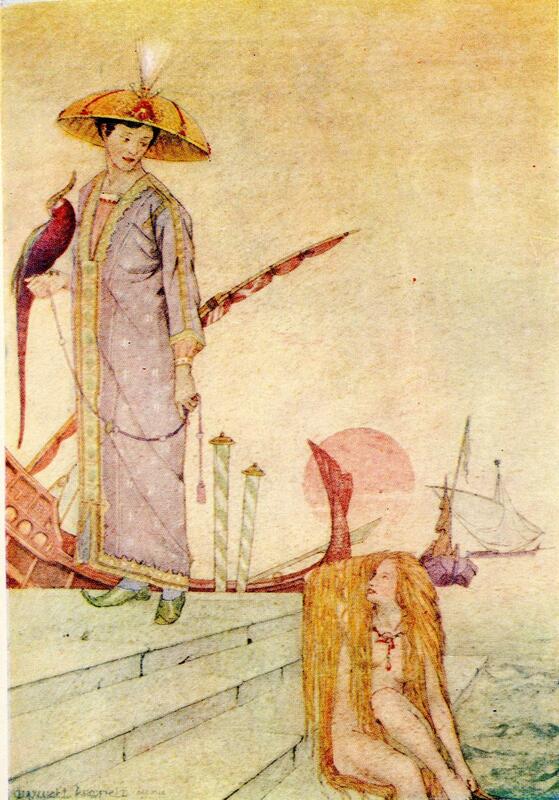 Although this work contains many tales such as, “The Emperor’s New Clothes” and “The Swinehead”, “The Mermaid” is the only one mentioned in the title indicating significance to the author. Earlier in his life Andersen wrote both Agnete and Merman and The Little Sea Maid, demonstrating a fascination with mermaids. Perhaps one reason was his apparent struggle with his own sexuality and that he had a history of falling in love with women who he knew he could never have (Nikolajeva). He may have considered himself an outsider (like the Mermaid) who could never really fit into a world he perceived to be outside of them. The illustrator of The Mermaid and Other Tales, Maxwell Armfield, chose only to do two illustrations for “The Mermaid”. 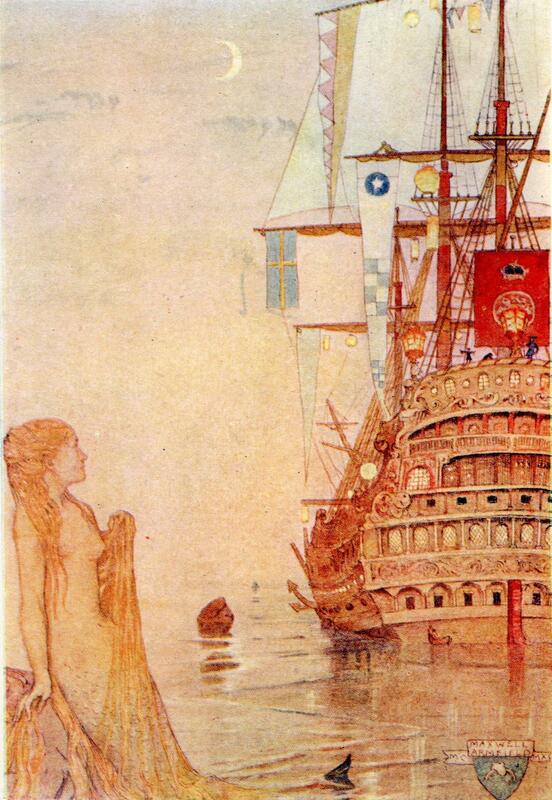 In the first illustration is located in the frontispiece and depicts the mermaid seeing the ship for the first time. The flag on the approaching boat is Swedish, while Hans Christian Anderson is from Denmark. They are both Scandinavian countries with body of water between them, perhaps furthering the notion of having one’s desire obstructed. His fascination with the sea is apparent in both his work and choice of subject so much so that a statue of The Little Mermaid has been placed in the Copenhagen Harbour in his honour (Mortensen 438). The mermaid meets the prince as a human. The second illustration done by Armfield depicts the mermaid meeting the prince after she has been transformed into a mermaid. An interesting thing to note is that the prince is shown to be Asian through the use of stereotypically Asian features like his clothing or shoes. The ships are not Scandinavian like in the frontispiece, but instead are Asian-insipred like the prince. 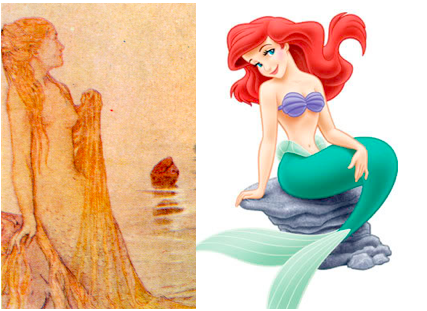 The Little Mermaid is shown as being completely naked aside from her long hair. In The Mermaid, mermaids are described as beings possessing fish tails for legs and having the upper body of a naked human. One could think of the mermaid as adolescent in her desire for experience, but she has an inability to follow through due to her body and soul’s limitations. For example, the mermaid desires the prince, but is unable to attain the prince’s requited love and the immortal soul that becomes possible from being a human. A Bildungsroman, or a coming of age story, is a story or novel that focuses on an adolescent’s experiences that focuses on a young character and their experiences that lead to self-discovery and maturity (Pettigrew). The mermaid in “The Mermaid” is an adolescent character who begins the fairy tale at fifteen years old. Through the story, the mermaid faces many personal and physical challenges that cause her to become more mature and adult-like. At the beginning of the tale, the mermaid is very child-like, but through her struggles, she becomes more mature. While living underwater, the mermaid was fascinated with the human world and her sense of curiosity interfered with her sense of reasoning (Cravens 638-639). Once the Mermaid experienced life above the sea, she began to experience a sense of love and lust toward the Prince. At first, she hides from and becomes timid every chance she has to reveal herself to him (Dahlerup 418), which is indicator of her child-like reaction to her new feelings. When she realizes that she cannot stay in the human world, she reacts in another adolescent manner by running off and bargaining with the sea witch. By not carefully considering the consequences of the deal, she agrees to exchange her voice for becoming human and would not be allowed to go back home. The maturation of the Little Mermaid developed through the pain that she endured. She saves the Prince from drowning at her own risk and then must listen to him speak of his desire for another woman. He treats her more like a child or pet that he permits to sleep outside his door (Dahlerup 422). Upon seeing her sisters, she realizes what she has done to her life. In the story, her sisters then beg the witch to allow the youngest to return, but only if she killed the Prince, but The Little Mermaid endures watching the Prince marry another. She knows that she will die, but out of a sense of morality she allows another to live happily ever after, while accepting her own terrible fate. Despite not getting the Prince to marry her, she is rewarded with immortality for good behaviour, which is a common theme among fairy tales (Mortenson 439-440). She has evolved from a selfish, naïve and inquisitive mermaid into a self-sacrificing, wiser and moral soul. Andersen’s The Little Mermaid was adapted from a literary fairy tale into an animated film of the same name by Walt Disney in 1989. The film, although maintaining many of the same characters and plot, diverges from the Andersen original through the portrayal of its characters and the values it promotes. The key change between variants is the ending, where, in the Andersen tale, the mermaid dies and becomes a daughter of air. Ariel, the protagonist in Disney’s The Little Mermaid, however, marries the prince and lives happily ever after. Many Disney films, such as Snow White, Bambi or numerous others, focus on the coming of age story trope, where the hero faces a challenge and overcomes it, thereby leaving childhood and entering adulthood. While Andersen’s literary fairy tale does not focus on female maturation (Trites 152), it portrays a very different message than the Disney film. As fairy tales change over time, place and medium, the representation of mermaids, the story of The Little Mermaid and the depiction of female maturation all reflect cultural ideologies from when the variant was created. In both the Andersen and Disney versions of The Little Mermaid, the protagonist want to transform herself from a mermaid into a human to transcend from her world into another. The motivations for this transformation are different. The mermaid wants to become human to gain a chance at an immortal soul, while Ariel wants to transform because of her materialistic obsession with human culture and, later, the prince. In the Andersen tale, going to the surface is a right of passage at the age of fifteen, which implies that his tale is in part a coming-of-age story for the mermaid. In contrast, Ariel and her sisters are banned from going to the surface by their father, which feeds Ariel’s obsession with human culture and interprets this as being forbidden from falling in love (Trites 146). The transformation between mermaid and human requires the sacrifice of a voice from both mermaids, but it is depicted as being an extremely painful existence for Andersen’s mermaid, while being much simpler for Ariel. The mermaid endures the suffering to gain an immortal soul, while Ariel does it so she can be attractive to the prince (Trities 148). The protagonists go from being a child in the family, the discovery of humans to reaching adulthood in some form of self-actualization, which characterizes a coming of age story (Mortensen 445). 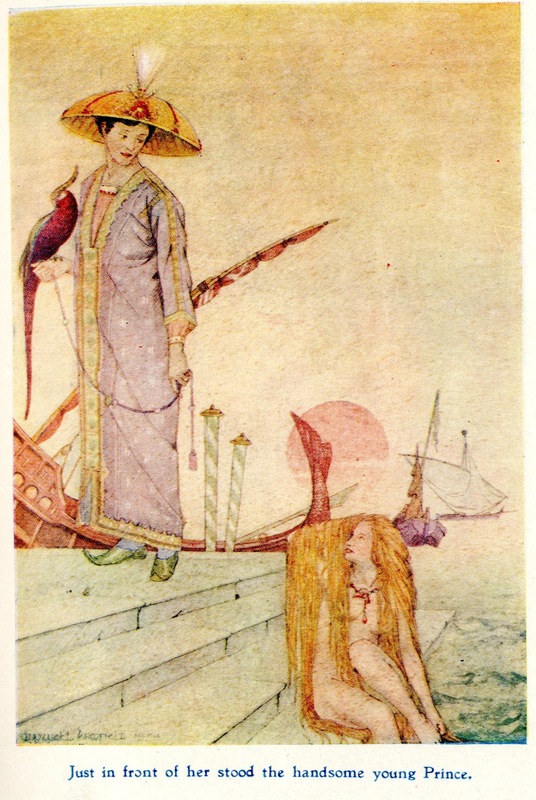 By shifting between sea, land and later air, Andersen’s mermaid’s journey into adulthood is shown as she takes responsibility for her actions (Mortensen 445) and actively shapes her own identity by choosing to die rather than kill the prince (Trites 148). Ariel’s journey, on the other hand, culminates with the prince destroying the witch and her father allowing her to become human. There is a scene where Ariel emerges from the water as a human, which implies rebirth as an adult. Disney attempts to show this through a separation between Ariel and her father, but she is not truly self-actualized, as she does not earn her independence, but is instead transferred to the prince (Trites 151). There are a lack of female role models for Ariel in The Little Mermaid. This is contrasted with Andersen’s original which contained the grandmother, sisters, daughters of air and even the sea-witch as positive feminine characters (Bendix 285; Trites 152). Instead, the film focuses on the relationship between Ariel and her father Triton. While the original tale had some form of matriarchy, Disney’s version is a more overt patriarchy, with Triton being controlling over all aspects of Ariel’s life and displaying this in rages towards her (Bendix 286). Both of the mermaids see the prince as a way to transcend from their lives in the sea, but their perspectives towards love and their purpose for loving the prince differ. The mermaid in Andersen’s tale sees her love for the prince as a way to gain eternal identity through mortal love (Trites 146). The Disney mermaid, on the other hand, equates love with marriage and sees marriage as her goal as she is incomplete without a man’s love (Trites, 146). The Disney version portrays Ariel as having matured because she experienced love, while Andersen’s variant depicts love as coming after maturity (Trites 148). The main aspirations and eventual fates of the mermaid and Ariel reflect some of the goals of womanhood or adulthood at the time and place they were created. Andersen’s mermaid sacrifices her body to earn the reward of the immortal soul, which reflects both upon Christian morality, as well as a reflection of Andersen’s life circumstances (Bendix 283). The delayed gratification of gaining an immortal soul after 300 years with the children of air is also indicative of the values during Andersen’s lifetime (Mortensen 447). Similarly, Ariel’s materialism, marriage of the prince and happy ending are all indicative of Disney’s corporate culture and the idea of female maturation in the modern day. While releasing The Little Mermaid, Disney also sold various merchandise related to the movie (Bendix 280; Mortensen 448) and this continues with the Disney Princess line of merchandise, which is reflected in Ariel’s obsession with human “thingymabobbers”. In the end, Ariel gets a happy ending, which reflects the American dream and Disney’s wishes come true slogan (Bendix 289). By having Ariel’s goal as marrying the prince, Disney offers marriage as the ultimate goal of womanhood and as being compulsory for a happy ending (Trites 151). The physical depiction of the mermaid’s attire also varies between mediums, which implies a difference in how the adolescent female form is depicted. In the two images of the mermaid in The Mermaid and Other Tales, the top of the mermaid’s body is naked, covered only by her long hair. On the other hand, Ariel in the Disney film wears a seashell bra to cover her chest, which simultaneously censors her body, but also further sexualizes it by having the bra resemble a bikini. Despite Disney deeming the naked mermaid as inappropriate for children, Ariel is still sexualized (Trites 151). This reflects a strange dissonance in Disney’s approach towards sexuality and it’s appropriateness for children. The Little Mermaid is a fairy tale that has been through many adaptations since it was written by Hans Christian Andersen in 1836 in his native Danish (Nikolajeva). 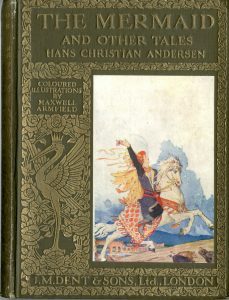 The children’s anthology of Andersen fairy tales, The Mermaid and Other Tales, provides an English translated and illustrated version of the story aimed towards American and British children in 1914. The Disney film also is also reflective of the culture it was created in, with the changing of the ending and the depiction of characters. We have compared the depiction of mermaids in both of these variants, as well as how female maturation is depicted in each version. Because The Little Mermaid is a tale that shows a character maturing from a child to an adult, it is enjoyed by many children. Society should understand and be aware of the messages and images portrayed to children, especially girls, about female maturation and life goals. By better understanding that the time, place and medium of a work can influence how it is shown and interpreted, readers and children can be more aware that what is shown in a text is not necessarily what they should strive for. Andersen, Hans Christian. “The Mermaid.” The Mermaid and Other Tales. Trans. Edgar Lucas. Illus. Maxwell Armfield. London: J.M. Dent & Sons Ltd.; New York: E.P. Dutton & Company, 1914. 9-35. Print. Bendix, Regina. “Seashell Bra and Happy Ending: Disney’s transformations of ‘The Little Mermaid’.” Fabula 34 (1993): 280-290. Academic Search Premier. Web. 14 Oct. 2011. Cravens, Gwyneth. “Review of ‘The Little Mermaid’” Nation 254.18 (1992): 638-640. Academic Search Premier. Web. 12 Oct. 2011. Dahlerup, Pil. “’Little Mermaid’ Deconstructed.” Scandinavian Studies 62.4. (1990): 418-428. Academic Search Premier. Web. 14 Oct. 2011. Dulcie Pettigrew “Bildungsroman or Novel of Education” The Oxford Encyclopedia of Children’s Literature. Ed. Jack Zipes. Oxford University Press, 2006. Web. 12 Nov. 2011. Mortensen, Finn Hauberg. “’The Little Mermaid’: Icon and Disneyfication.” Scandinavian Studies 80.4 (2008): 437-454. Academic Search Premier. Web. 14 Oct. 2011. Nikolajeva, Maria. “Andersen, Hans Christian.” The Oxford Encyclopedia of Children’s Literature. Ed. Jack Zipes. Oxford University Press, 2006. Web. 16 Oct. 2011. Trites, Roberta. “Disney’s Sub/version of Andersen’s ‘The Little Mermaid”.” Journal of Popular Film & Television 18.4 (1991): 145-152. Academic Search Premier. Web. 14 Oct. 2011.